One of the most frustrating parts of embroidery is figuring out how to manage the various spools of thread needed when doing a whole set of embroidery. 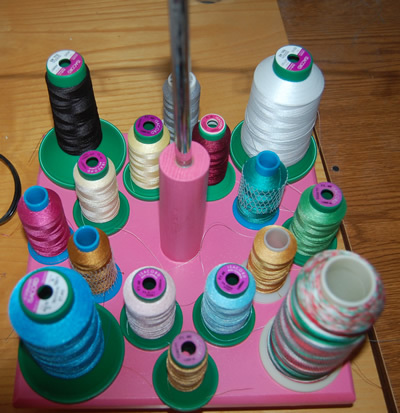 There are a variety of thread stands on the market today but many are more trouble than they are worth. Thread needs to feed into your machine from the side (near the fly wheel) rather than from behind the machine where many of the current thread holders are supposed to be placed. If you do a lot of embroidery you will discover that thread sold on cones can be much less expensive than thread sold in small spools. But cones are designed so that the thread should unwind by lifting upward from the spool - not while laying sideways on the spool holder of most embroidery machines. In fact, using cone threads sideways on the machine actually adds tension to the thread that may cause shredding and breakage. our stand can hold all size cones, including the cones that have a 3 inch base. our stand can accommodate any height cone. the top of our thread rack is telescopic - so you can raise it to whatever height your machine needs for easy thread passage. 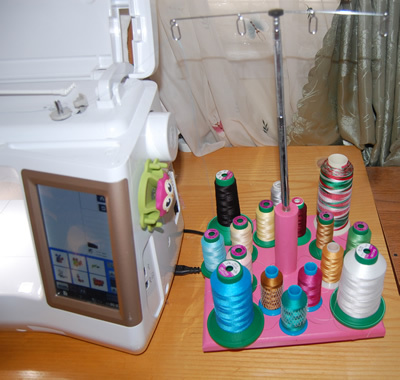 The base of our stand rotates so you can turn it to get to the next thread color you need. our stand holds 16 spools at a time - more than enough for most sets. our stand does not attach to your machine so it will work with any machine! our stand arrives fully assembled - you don't need to build anything! like the thread guides on a serger, our thread guides are open and super easy to use (no threading through a small hole). The base of the stand is 9 inches square (you need just 14 inches of space so that it can rotate freely). It stands neatly at the end of your machine, giving you easy access to it while you are embroidering. You don't need to connect anything or anchor it in any way - the weight of the stand is sufficient to hold things in place for you. The thread guide at the top may vary slightly from the ones pictured here. These are made entirely in the US (at our house!). 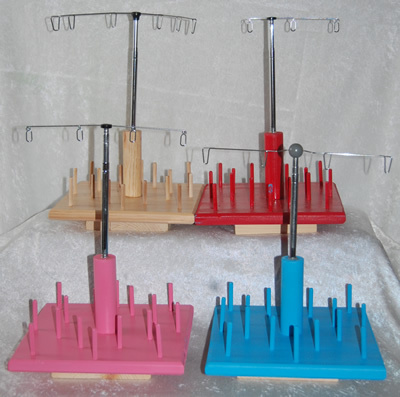 The racks are available in pink, blue, red or natural wood. Please select your preference below. We want to make this as simple as possible. Flat rate shipping to the continental US is $10.00. If you are outside of the US, please contact us first so we can let you know what the shipping rate would be. We will update this page if we run out of any color or if new colors become available.